Painted turtles are a common sight throughout most of North America's ponds, lakes and other freshwater habitats. 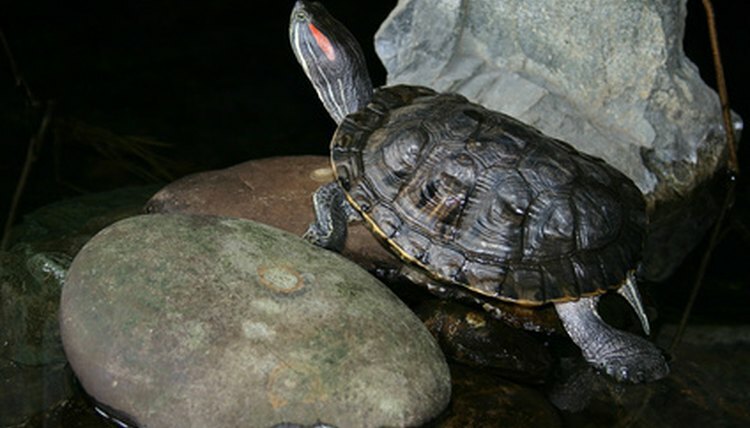 You can often spy painted turtles basking in a sunny location near the water, such as a rock or log. Captive turtles need a tank that closely resembles their natural habitat, including a swimming area, shallows and a beach, along with the proper lighting and heating sources. A tight-fitting screened lid is also important to help keep the turtle from escaping its habitat. Pour the substrate into the tank. Create a gentle slope at one end to provide a beach (basking) area. Make two slopes to create an additional shallow area, if your tank is long enough. The deep end should be deep enough for your turtle to completely submerge -- the deeper the better, as these are aquatic turtles. Fill the tank with water up to the basking area. This area should remain practically dry. Place the driftwood or basking rock on the beach area, slightly overhanging the water if possible. Set up your fluorescent light above the tank, over the deeper end. This light provides needed UVB rays for a healthy turtle. Place your heating light (incandescent) or other heating device over the basking area. Many of these lights have clamps, but there are different designs. Read the instructions carefully on your chosen light sources for setup. The tank's overall temperature should remain around 70 to 85 degrees, while the smaller basking area should read around 90 to 95 degrees. The lights should be used approximately 12 hours per day to mimic day and night. Place a thermometer at each end of the tank to measure basking and swimming area temperatures. Set up the feeding tank. Feeding tanks are optional, but they help keep the main tank cleaner. Turtles can defecate shortly after meals and tend to be messy eaters. A feeding tank should have water, as painted turtles enjoy live feeder fish and other foods they eat in the water. The water level should at least cover their entire shell, and you do not need a beach area. This is simply a feeding area for your turtle, and the turtle will not be in there for long. The tank needs to be just large enough for your turtle to feed and move around in. Mist the habitat with the spray bottle one or two times per day to maintain the proper humidity level. Humidity within the tank should remain around 70 percent. Buy a book on painted turtle care. These books often have tips, warnings and guides for the care of your turtle to help you out when need be. What Do Water Turtles Look Like? How Long Does It Take for a Turtle to Get Used to His Tank?